The presidential campaign is in full swing. To win over the Ukrainian people, candidates often appeal to economic facts. Poroshenko focuses on the positive changes in the economy, as if all of them, without exception, are the result of his team’s work. The competitors focus on economic failures and problems, so it may seem as if he is to blame for all the troubles of the country. It is difficult for the voter to pick the wheat from the chaff. But we really want to make our choice easily, efficiently and effortlessly. As is often the case, the truth is somewhere in the middle. It is that, apart from the government, which “does everything correctly,” and the opposition, which always “knows how it should be,” there is still a third force – economic laws. They act regardless of what the government or the opposition wants. And the result of this action often speaks of the situation in the country more than any of the politicians. One of these laws can be formulated like this: businessmen always hunt for profit and do it in sectors where they can get the most effective output. Virtually that’s true in every country under any authority. To have a profit, you must first invest. Before doing this, every businessman carefully weighs up the pros and cons. Investing is alike an election: businessmen seem to vote in dollars for those industries, projects, countries that are able to provide the greatest amount of profit at the least risk, and are not inclined to invest in where they can lose. Therefore, all investments are a kind of “rating” of the most attractive sectors of the economy. Unlike political ratings, it is based not on the irrational preferences of voters, but on the cold, sober approach of people who consider every penny and risk their own capital. Such a “rating” very well shows in which areas there is potential, additional opportunities appear or various barriers are reduced. And analyzed in dynamics, this “rating” gives us a good idea of ​​which way the country is changing, and indicates reforms or their absence better than any of the politicians. The best way of comparing investments is over several years and at least over one political or economic cycle. Because during such a period of time any country experiences a vast amount of changes that are quite well covered by statistics. In Ukraine, during the last three political cycles, there occurred two deep economic crises; that’s why, by comparing investment figures in 2007, 2012, and 2018, you can see where we were and where we are going. 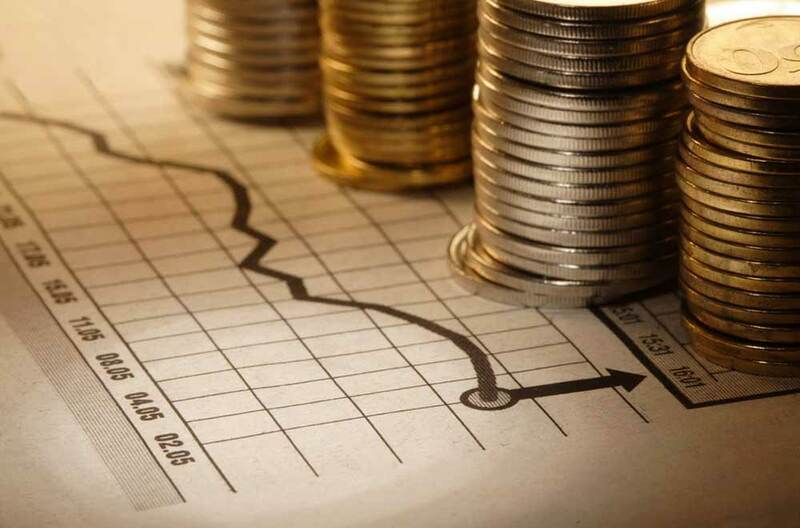 In 2018, the volume of capital investments in Ukraine amounted to UAH 526 billion. In dollar equivalent, this is 40% less than in 2012. But in real terms, this is 11% more. That is, today investments are cheaper than they were then, but there are more of them in volume. This means that now businessmen believe in Ukraine more than in 2012, which was the most successful year during Yanukovych rule in terms of investment. In 2013, investors realized who was who and how bleak the prospects for Ukraine were, so over the course of that year, investment fell by 11%, although there was no official crisis reported. Then, the fall continued as a result of the war and deep crisis, but over the course of 2016-2018, Ukraine by far made up for losses in terms of the volume of investments. And this is evidence that ahead of us there are changes for the better. Because today’s investment will benefit in the development of the economy and GDP growth tomorrow. However, in real terms, the volume of capital investments is still 19% lower than in 2007. Back then it was a record one in the history of independent Ukraine. What was the reason for this? Excessive faith in Ukraine due to the victory of the Orange Revolution or the global peak of economic development? Perhaps, both. However, each of the factors over time ceased to operate, that is, the figures for 2007 were somewhat divorced from reality, to which the country eventually returned. A comparison of the structure of capital investments in each of these periods gives several interesting results (see The structure of investments in the economy). First of all, over the past 6-11 years, the share of investment in agriculture has more than doubled. This corresponds to the current value of the industry for the economy of Ukraine. Neither war nor deep economic crisis prevented the rapid development of agricultural production. It is still in progress, despite the fact that the land reform is not completed, and the state is not helping agribusiness and sometimes even hampers. This suggests that in the long run there are practically no obstacles to the development of the industry with its unique potential. No matter how bad the investment climate and economic situation are, the capital will always find a way to where it is going to substantially increase its value. Politicians have nothing to do with it; neither those who support this development, nor those who hinder it. Another important nuance: over the past decade, agriculture has actually been developing only thanks to a large, mainly oligarchic capital. In the face of chronic problems in the banking system and the lack of a land market that could be used as collateral, a permanent financial resource was available only to oligarchs. Therefore, today in agro-production there is a high degree of concentration, and many politicians are sounding the alarm, advocating the need to restore the importance of small and medium-sized farming and making it a prerequisite for launching a land market. In any case, we can state the rapid development of Ukrainian agriculture over the past 6-11 years. Is it good or bad? Neither one thing, nor the other. Yes, on its own, the development solves many problems, but as a result a number of other issues arise. For example, in the case of agribusiness, Ukraine now has significantly higher rates of agricultural production, agricultural exports and foreign exchange earnings from it. But there are also negative side effects: the strengthening of a number of oligarchs who are already trying to negatively influence the state, the reduction of jobs that have become unnecessary after the introduction of new, more efficient technologies. And most importantly: the rapid growth of agricultural production has attracted the attention of criminals to the sector, so there have been widespread cases of agricultural raiding, stealing of crops from fields and the like. That is, with the development of agriculture, the country has got ahead, but new problems have appeared, perhaps no less complex and acute than they were before. One can observe interesting dynamics of investment in construction. In 2007, we had a real investment boom. But it was not fully realized in terms of construction (and, accordingly, investment in the industry), because there were huge obstacles to obtaining land for building construction and all the necessary permits. Therefore, for example, the indicators of housing development sector in 2012 and 2018 exceeded those of 2007. Investment in the industry is quite consistent with this trend. Due to inadequate construction, housing prices grew rapidly, so it was an attractive investment vehicle at that time, so real estate transactions in 2007 accounted for the lion’s share of capital investments and pointed to a price bubble that eventually burst. In 2012, the country was preparing for the European Football Championship, therefore, in addition to housing construction, that of infrastructure was in full swing. Considering that all this was accompanied by huge embezzlement of budget funds, the share of investment in construction was perhaps the highest in the entire history of Ukraine. But very few people invested in real estate operations, since the prices for it during the crisis of 2008–2009 collapsed and remained at about the same level for a number of years. In 2018, obtaining a building permit is already easier than in 2007 (which is also evidence of changes for the better), so its volume is larger than before. Last year, new housing construction standards were introduced in Ukraine, and now housing and social infrastructure next to it will be of higher quality. In addition, the state is investing heavily in the construction and repair of roads, while the scope for embezzlement is much less than in 2012, thanks to transparent tenders and the ProZorro public procurement system. Therefore, the share of investment in the industry is more than in 2007, but so far less than in 2012. Does this indicate that the country is moving forward? Perhaps yes. In some industries, the dynamics of investment is very revealing. For example, investments in trade gradually lost their significance, and now it is being restored. Before the crisis of 2008–2009 under the conditions of a rapid increase in retail lending, this industry was one of those that developed most rapidly. But after the crisis, as a result of falling aggregate demand, trade lost its attractiveness, which affected investment in it. Now incomes of the population are growing for a good 10 quarters in a row. As a result, trade again becomes attractive for investment, capital returns to the industry. Today, the situation in public administration and defense has changed dramatically. Over 11 years, the share of investment in the industry has increased more than nine times. It is clear that war is the objective reason for this. But current investments are directed not only to the needs of the army, but also to the development of the military-industrial complex and the actual reform of national administration. It is possible that the results in all areas where the funds are invested are not yet visible, but in some of them, for example, in logistic support of the armed forces, we have had titanic changes. Does this indicate progress in the country? Sure. Much the same can be said about education and health. Under Yanukovych rule they were led by the brilliant kleptocrats Tabachnik and Bohatyryova. Then these sectors accounted for the smallest share of investment. Obviously, they were underfinanced for a long time, but until recently there have been no structural, market prerequisites for monetary investments either at the state level or at the level of private investors. Today such prerequisites appear as a result of reforms. That is, despite the entire public response caused by all metamorphoses in the educational and medical sectors, the numbers speak for themselves: over the past six years, the volume of investment in them has grown almost one and a half times in relative terms (from 0.5% to 0.8% in education and from 1.0% to 1.5% in medicine) and almost tripled in absolute terms. If the changes did not create the right opportunities, no one would put their hard-earned money into these sectors. 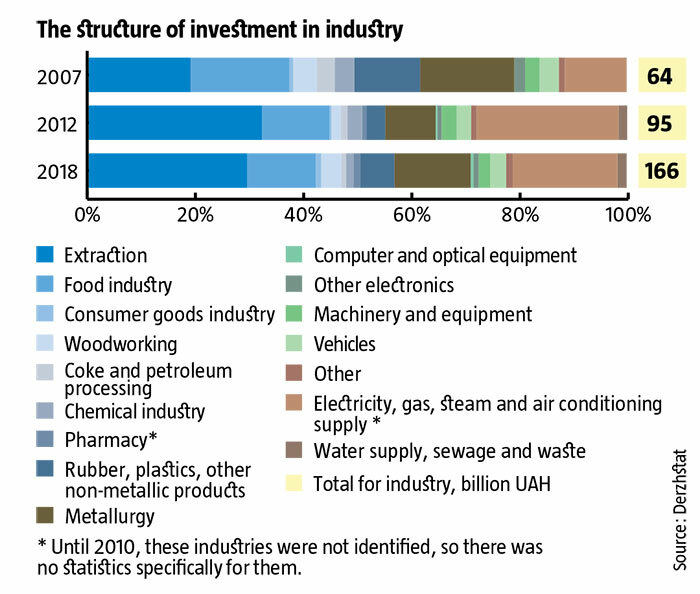 In general, the share of investment in industry for 10 years has not changed. But its dynamics differs significantly in sectors. Before the crisis of 2008–2009, investments in the extractive industries accounted for less than one fifth of industrial investment. 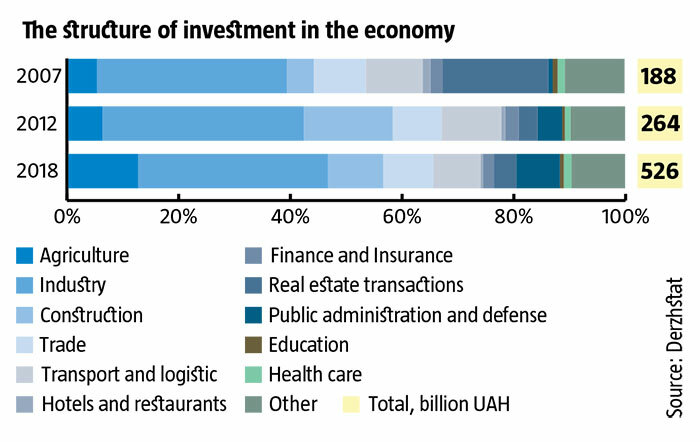 But under Yanukovych rule, and now this industry attracts almost a third of industrial investment. However, there are some nuances. During Yanukovich’s term, mining was the economic basis of the regime, and the state worked to ensure that oligarchs such as Kurchenko, Yanukovych Jr., Zlochevskiy or Stavitskiy would build up assets as soon as possible. Today, the main reason for the intensive investment is the introduction of market rules of the game, in particular, bringing energy prices to market levels and an increased need for fuel resources as a result of refusing to import Russian gas and losing control over part of the Donbas mines. Investments are already yielding results: over the past few years, a long-term trend towards a decrease in its volumes has occurred in the natural gas extraction. Is this a positive change? Without a doubt. Another example is consumer goods industry. The low cost of labor, established after the crisis of 2014-2015, stimulated the flow of investment in the industry, so over six years, its share increased 2.5 times. In absolute terms, investment in consumer goods industry increased almost fivefold. The industry has not yet become the cornerstone of Ukrainian industry, but has already given more than one hundred new jobs. The trend is positive, but it is due solely to the actions of economic laws, and not the actions of any of the officials. It is important to note that investments in traditionally oligarchic sectors, for example, chemical and metallurgical, have not recovered after the crisis of 2008–2009. Then the oligarchs had a lot of money and constant access to government resources, so they no doubt invested in industries with limited prospects from a business point of view. Now the situation is different; access to state resources is much smaller, there is not so much money, so you have to think carefully before investing in this or that project. The result is obvious: in 11 years, the share of capital investments in the chemical industry has decreased from 3.7% to 1.4%, and in the metallurgical sector – from 17.5% to 14.2%. This is definitely a positive trend. Because if we consider the development of a country in the context of economic growth, then the more successful investment projects that society chooses (oligarchs, the state, small and medium businesses), the faster the country develops. So, wastefulness and meaningless of capital investments are a deterrent. It should be understood that the money of the oligarchs is not only their private capital, but also the capital of the country. Proper use of it accelerates the development of Ukraine, and the wrong one, on the contrary, slows down. Therefore, if oligarchs lack patriotism and social consciousness in order to invest their money qualitatively, then the state should create systemic prerequisites for them to be forced to do so, so that they have no other choice. Actually, the last few years have confirmed that the comprehensive introduction of market mechanisms makes the oligarchs manage the capital more rationally, directing it to where it gives the country much more benefit than before. Of course, this is good for Ukraine, regardless of your attitude to the oligarchs. As a result, the dynamics of the investment structure shows that in the last 6-11 years many changes have taken place in Ukraine. In many cases, the investors’ conduct has radically changed, which in turn changes the structure of the economy and the list of sectors that determine its development. In most cases, these transformations are positive. They indicate that the country has begun to move in the right direction. So, in this movement there is not enough consistency and pace, but no one can say that we are marking time or rolling back.